At Hallmark- one of the Top 10 Schools in Tricity, we know you wish the best for your child. Guess what? We stand with you in your mission the get the best for your child. The campus infrastructure is one of the foremost factors that decide the quality of education in a school. The infrastructure not only enhances the learning experience for the students, but it also creates immense opportunities for them to experiment and learn new and amazing things. Here are the highlights of infrastructure offered by Hallmark Public School that makes it the best amongst the CBSE Schools in Panchkula. All the classrooms at hallmark have been equipped with the latest audio and visual teaching aids to enhance the learning experience of the students. These technological aids make the teaching interactive and act as something that makes the students take interest in the subject. 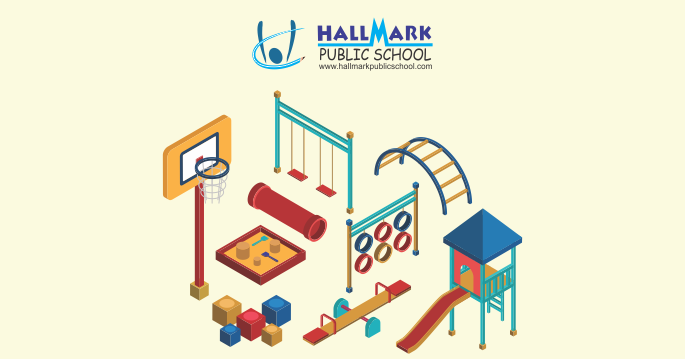 One of the most attractive key features of Hallmark is this magnificent, multi-game court which allows the students to try their hands at various sports and explore the opportunities. The sporting arena can be used to play basketball, volleyball, football, badminton and lawn tennis – all at one place. While the multi-sport arena caters to all the outdoor sports needs of the students, Hallmark also has magnificent facilities for indoor, table and board games. Our students play various indoor games like table tennis, carom, and snooker. We have a dedicated shooting range, and our students specialize in the game of chess. The school students participate in various national and regional championships and win. At Hallmark, we have always encouraged our students to push their limits and be the best at whatever they do. Our infrastructure only reiterates our mission and vision. When at Hallmark, you rather stay assures that your child is getting the best infrastructural facilities possible. Admissions are open for the session 2018-19.